"Hello World" redirects here. For other uses, see Hello World (disambiguation). A "Hello, World!" 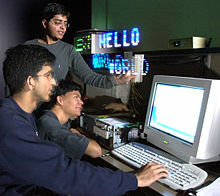 program generally is a computer program that outputs or displays the message "Hello, World!". Because such a program is very simple in most programming languages, it is often used to illustrate the basic syntax of a programming language and is often the first program that those learning to code write. A "Hello, World!" program is traditionally used to introduce novice programmers to a programming language. "Hello, world!" is also traditionally used in a sanity test to make sure that a computer language is correctly installed, and that the operator understands how to use it. The program prints hello, world! on the terminal, including a newline character. The phrase is divided into multiple variables because in B, a character constant is limited to four ASCII characters. The previous example in the tutorial printed hi! on the terminal, and the phrase hello, world! was introduced as a slightly longer greeting that required several character constants for its expression. The Jargon File claims that hello, world originated instead with BCPL (1967). [unreliable source? ]This claim is supported by the archived notes of the inventors of BCPL, Prof. Brian Kernighan at Princeton and Martin Richards at Cambridge. For modern languages, hello, world programs vary in sophistication. For example, the Go programming language introduced a multilingual program, Sun demonstrated a Java hello, world based on scalable vector graphics, and the XL programming language features a spinning Earth hello, world using 3D graphics. While some languages such as Perl, Python or Ruby may need only a single statement to print "hello, world", a low-level assembly language may require dozens of commands. Mark Guzdial and Elliot Soloway have suggested that the "hello, world" test message may be outdated now that graphics and sound can be manipulated as easily as text. A "Hello, world!" 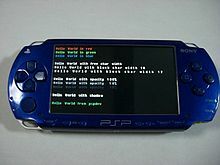 program running on Sony's PlayStation Portable as a proof of concept. There are many variations on the punctuation and casing of the phrase. Variations include the presence or absence of the comma and exclamation mark, and the capitalization of the 'H', both the 'H' and the 'W', or neither. Some languages are forced to implement different forms, such as "HELLO WORLD", on systems that support only capital letters, while many "hello, world" programs in esoteric languages print out a slightly modified string. For example, the first non-trivial Malbolge program printed "HEllO WORld", this having been determined to be good enough. There are variations in spirit, as well. 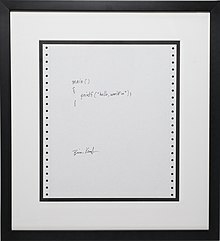 Functional programming languages, like Lisp, ML and Haskell, tend to substitute a factorial program for Hello, World, as functional programming emphasizes recursive techniques, whereas the original examples emphasize I/O, which violates the spirit of pure functional programming by producing side effects. Languages otherwise capable of Hello, World (Assembly, C, VHDL) may also be used in embedded systems, where text output is either difficult (requiring additional components or communication with another computer) or nonexistent. For devices such as microcontrollers, field-programmable gate arrays, and CPLD's, "Hello, World" may thus be substituted with a blinking LED, which demonstrates timing and interaction between components. The Debian and Ubuntu Linux distributions provide the "hello, world" program through the apt packaging system; this allows users to simply type "apt-get install hello" for the program to be installed, along with any software dependencies. While of itself useless, it serves as a sanity check and a simple example to newcomers of how to install a package. It is significantly more useful for developers, however, as it provides an example of how to create a .deb package, either traditionally or using debhelper, and the version of hello used, GNU Hello, serves as an example of how to write a GNU program. Time to "Hello World" (TTHW) is a metric for how long it takes to get a "Hello World" program running from scratch in a given programming language. ^ James A Langbridge. "Professional Embedded ARM Development". ^ a b Kernighan, Brian (1974). "Programming in C: A Tutorial" (PDF). Bell Labs. Retrieved 9 January 2019. ^ "The Programming Language B". ^ A Tutorial for the Go Programming Language. Archived July 26, 2010, at the Wayback Machine The Go Programming Language. Retrieved July 26, 2011. ^ Jolif, Christophe (January 2003). "Bringing SVG Power to Java Applications". Sun Developer Network. ^ de Dinechin, Christophe (July 24, 2010). "Hello world!". Grenouille Bouillie. ^ "Teaching the Nintendo Generation to Program" (PDF). bfoit.org. ^ "Malbolge". Esolang. esolangs-wiki. Retrieved 28 October 2016. ^ Silva, Mike (11 September 2013). "Introduction to Microcontrollers - Hello World". EmbeddedRelated.com. Retrieved 19 May 2015. ^ George, Ligo. "Blinking LED using Atmega32 Microcontroller and Atmel Studio". electroSome. Retrieved 19 May 2015. ^ PT, Ranjeeth. "2. AVR Microcontrollers in Linux HOWTO". The Linux Documentation Project. Retrieved 19 May 2015. ^ Andersson, Sven-Åke (2 April 2012). "3.2 The first Altera FPGA design". RTE. Realtime Embedded AB. Retrieved 19 May 2015. ^ Fabio, Adam (6 April 2014). "CPLD Tutorial: Learn programmable logic the easy way". Hackaday. Retrieved 19 May 2015. ^ "Hello - GNU Project - Free Software Foundation". gnu.org. GNU Project. Archived from the original on 29 May 2014. Retrieved 7 July 2017. ^ "Six Ways to Accelerate Time to First "Hello World"". ProgrammableWeb. Retrieved 7 September 2018. Wikimedia Commons has media related to Hello World. Rösler, Wolfram. "Hello World Collection". helloworldcollection.de. "Unsung Heroes of IT / Part One: Brian Kernighan". TheUnsungHeroesOfIT.com. Archived from the original on 2016-03-26. Retrieved 2014-08-23.